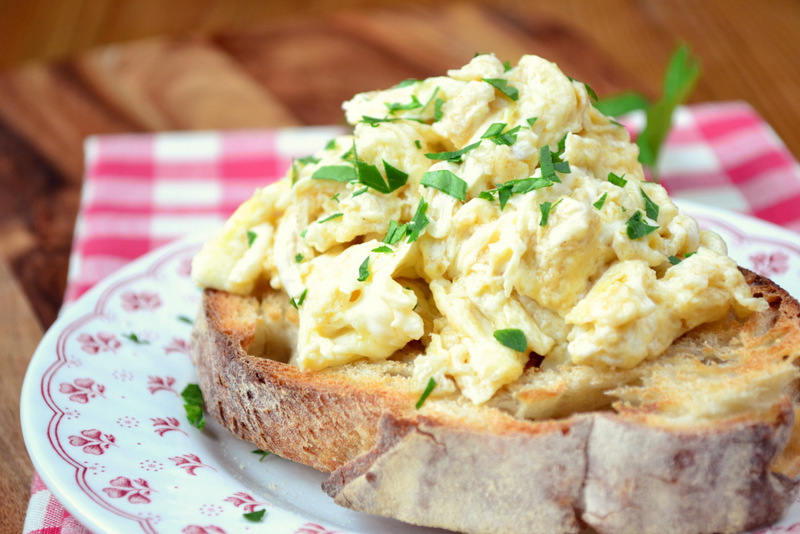 Dedicating an entire post to a recipe for scrambled eggs may, at first, seem a little extravagant and not at all frugal. However, when you taste these decadent, silky eggs and realise just how much nutty flavour brown butter is able to instil in your breakfast, you’ll be glad that I have. The problem with this recipe is that once you’ve made it once, you’ll want to make it again and again – the syndrome, I believe, is called pringleitis – a dangerous case of not being able to stop “popping” once you’ve started. Terrible though this may seem, there are far more unfortunate curses in existence and you’ll soon come to terms with it and the spare tyre you have unwittingly thought it best to store around your midriff – healthy eating this is not. Breakfast is a meal in which everyone should eat heartily. Indeed, it was once said that one ought to ‘breakfast like a king, lunch like a prince and dinner like a pauper’ and never has a truer word been spoken. Not only is cordial adherence with the saying the healthiest way to structure your daily eating habits – it gets your metabolism off to a jolly good start and it’s difficult to digest efficiently when you’re asleep – it is tantamount to an early morning constitutional and really serves to get those brain cells in order, if you are lucky enough to be in possession of any. It’s likely that should one eat well in the morning, one is more than likely to manage great things in the afternoon. With that in mind, on with the day and with the recipe! 1. 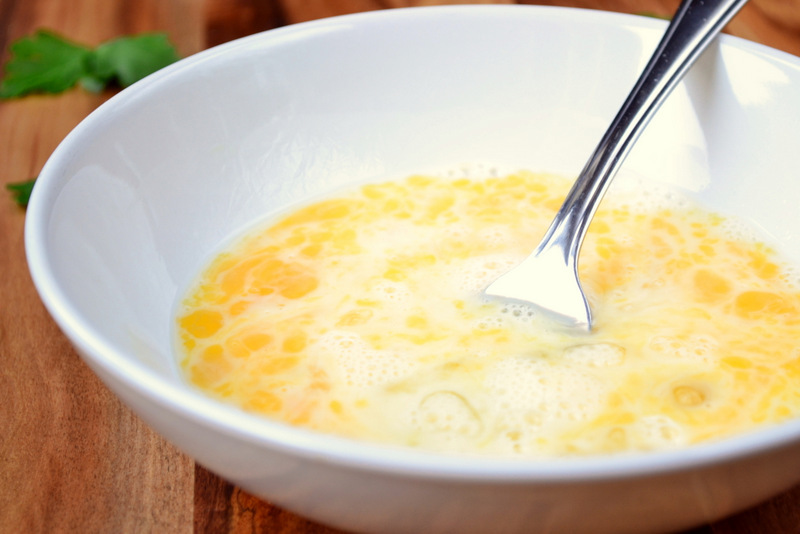 Crack your eggs into a bowl and whisk with a pinch of salt and pepper and the milk. Do not over whisk, it still wants distinct, but small, lumps of yolk. 2. Put a heavy based pan or skillet over a high heat. Add the butter and cook until it begins to brown, this should take a minute or so. Add the egg mixture and leave for 10 seconds, begin to move it around the pan until most of it is cooked – resist the temptation to mix it all really thoroughly. Cost: Eggs, bread and butter… what more can I say? They’re very cheap, you know that. In fact, my butter, which was purchased locally, was exceedingly cheap at only £1.50 per 250g. It also happened to be the best butter I’ve ever tasted. Anyway, before digression sets in, this dish should set one back no more than 80p – a very frugal start to the day and a cracking recipe. How funny, I’m having scrambled eggs for dinner – might give this a go as a twist on my usual recipe! Love the idea of the brown butter. Scrambled eggs are definitely underrated. Your toast looks good too! When I saw the title of this post I thought, “How have I not thought of this? !” I love brown butter. And I love scrambled eggs. A definite win in my book! Wonderful plate, bread and eggs! Look lush. You take a great food photo. Haa – shame :(. Can’t change it now you’ve mentioned it. Indeed! This stuff was properly good. Love the idea of brown butter to add nutty taste! 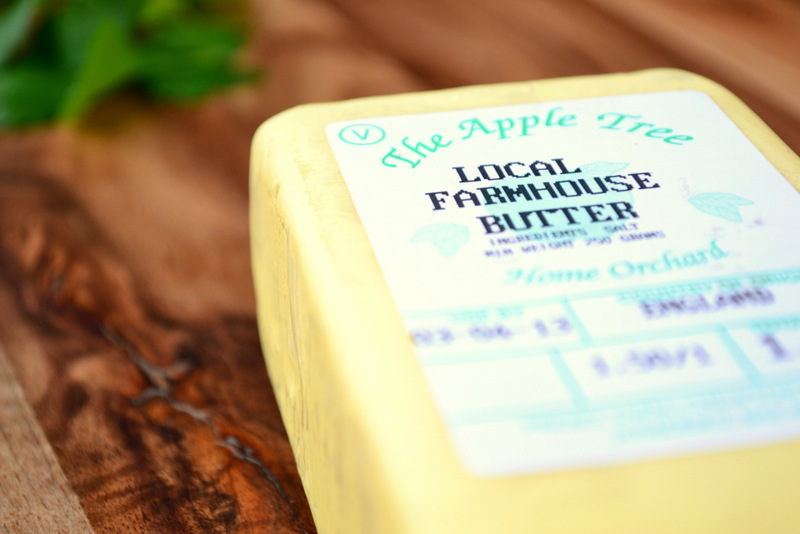 I get loads of different local butter these days! IT’s yum. Lots of great cheese too, had a nice feta yesterday. Haha – I should. Mmm scrambled eggs have never looked to good! Anything with brown butter is a winner. What a capital idea! And beautiful photos, too. Loving this post Nick! Nothing beats a fresh egg when one is ravished in the morning…and your method looks classic & flawless! Love the look of that crusty bread too! I think eggs are pretty frugal, and not so unhealthy if you skip the brown butter. But they wouldn’t be as delish! I’ve commented on your recipes, I’ve commented on your photos, but I have yet to comment on your excellent writing! This sounds incredible. 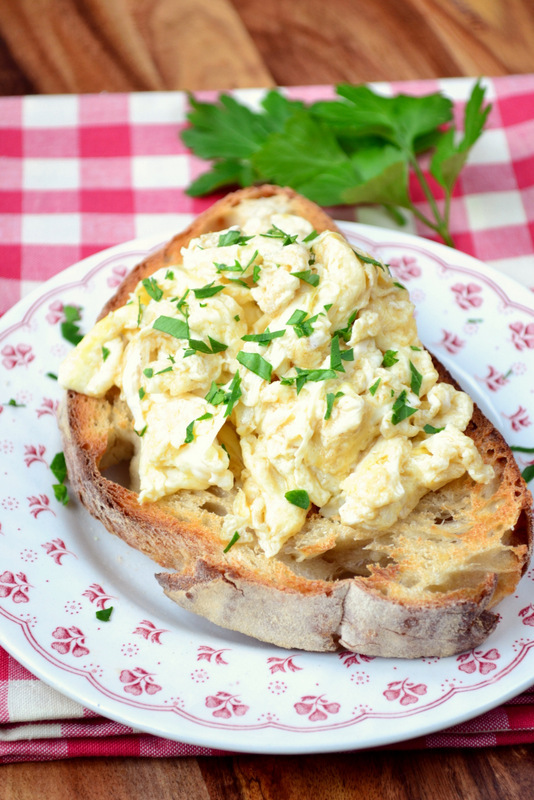 The French make their scrambled eggs over a Bain Marie and they fold them gently to get big puffy pillowy eggs! They also put a good knob of butter in them, but the brown butter sounds much better! I have scrambled eggs most days, and sometimes I let the butter go too far, by which I mean to say I make eggs with brown butter. Sounds much more elegant that way. Must say, the way you’ve made and presented yours make them much more of an occasion than what I usually bang together. Indeed, the humble egg is an elegant thing and deserves such special treatment. Can I have one for breakfast, please? :) Like it! Definite foodporn moment! Eggs are one of my definite all time favourite things to eat, whether on their own or (in/with) other foods and these scrambled eggs truly look like perfection! These look delicious. Definitely trying it! You had me at brown butter. I have out of town visitors this weekend, and these are going on the brunch menu! Thanks for another great idea. What I would give to have butter like that in the states…if I could find it, it would cost an arm and a leg. Maybe its time to buy that cow. That looks so yummy…can’t wait to surprise my teens with a new breakfast this weekend! Haha – there’s loads of it here! Simply and nicely done. How great that you can get local butter?!? I need to eat this right now. I also need to master brown butter. (Brown butter for brussel sprouts, brown butter for cookies, and now eggs?) I’m in heaven. Just use a very high temp and don’t burn it! Browned butter makes everything better. PS. Pringleitis? I snorted when I read that. Ha! Lovely stuff. Great concept and well executed. Fabulous, is it naughty to add just a little bit of cheese too!? Vintage mature cheddar of course! Go for it, would be yummy! We buy fresh eggs from a local farmer and I have had many a dinner of scrambled eggs. Love them. Thank you for this recipe! So simple yet I am sure they are sooo delicious. I did not have breakfast yet and they sound like a great idea to me right now! Really like the blog, will be keeping an eye out for more! Just happened on your blog and wanted to say great job! It’s so great to find another food blog created by a guy. We’re definitely in the minority. You’re photography and creative recipes look great and I’m definitely putting you on my blogs to follow list. Happy cooking! There aren’t many of us! Great! Thanks. 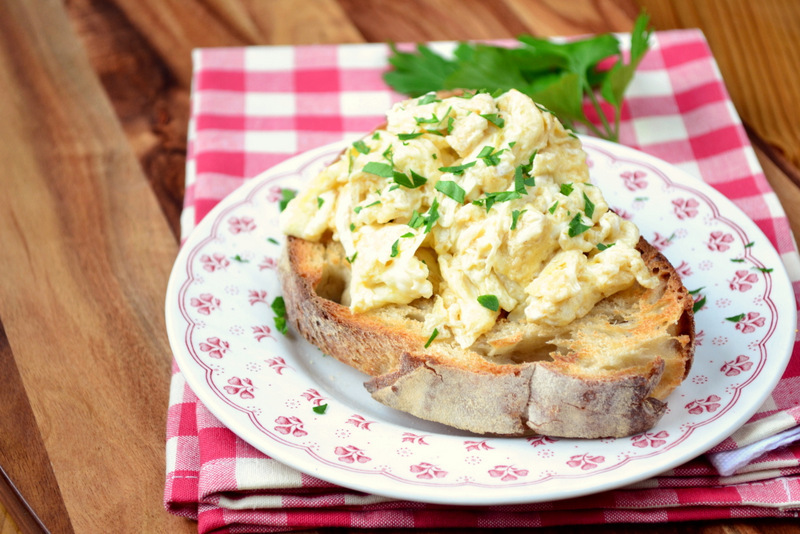 Who knew scrambled eggs, the ultimate comfort food, could get better! Now I feel like I am missing something because my eggs never have brown butter in them! The title got me in straight away. Two things I love – butter and scrambled eggs. I know what I will be making for dinner tonight. Not just a breakfast food! So hungry this morning. Delicious looking breakfast stuffs teasing me. Must have them. Must have them now! Nom Nom Nom, mmm, tastes like monitor. 😉 Looks fantastic, can’t wait to try this out! I know what I’m having for breakfast tomorrow. I love brown butter-scrambled eggs! These look delectable, Nick. Oh still-beating heart be still! thanks! they are rather tasty! You must- it works wonders. I grew up eating this and my husband thought I was unique as he had never heard of it. Glad to know I am not the only person loves scramble eggs this way! !